Boxing defense makes you hard to hit. Floyd Mayweather and many other great champions built their careers on being defensive fighters. Many of Floyd’s techniques are different than what is taught in most gyms. He often slips punches with his hands down and leans back. These are two things that you should NOT do. It leaves you in a bad position to get hit with the next punch your opponent throws at you. You are also out of position to counter punch. 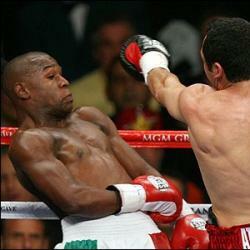 Yet, Floyd got away with slipping punches like this by using his superior speed and timing. I will teach you 3 defensive skills that you can use against opponents that are faster than you. These skills will leave you in position to counter punch. Every boxer should learn these 3 basic tools. Master them and you will become hard to hit with a clean punch. Watch the following short video on these 3 important defensive skills. Blocking punches is the easiest defensive technique to use; yet it is not the best, as demonstrated in the video above. When you block your opponents punches something great happens…you don’t get hit! That is boxing defense 101! Don’t get hit! • You help your opponent maintain or recover their balance. • They are in position to immediately throw another punch at you. • You absorb their punches with your arms and feel some of the impact of their power. However, blocking punches is sometimes the most effective defensive technique to use, especially when a punch is coming too fast to slip. Blocking punches is like having full-coverage insurance…it provides protection when you need it. More importantly this technique can keep you from getting hit with a solid punch. Practice the following drill on "Blocking the Jab," to begin mastering this technique. 1. Partner with a boxer about your size. 2. Have them throw a slower jab at you. 3. Block the jab using the outside of your glove as demonstrated in the video above. 4. As you get better at using this technique, have your partner increase the speed of their jab gradually until they are throwing their fastest “live” jab. 5. Continue practicing this drill throughout your boxing career. It will keep you sharp at using this skill. Parrying does require a bit more timing than blocking punches and there are some advantages. • You can actually use parrying to make your opponent lose their balance. • When you parry a punch you are in position to immediately counter your opponent. • You do not absorb nearly as much of your opponent’s power when parrying, as you do when blocking punches. • After you slip your opponent’s punch, they must completely recover their own balance, with no assistance from you. • You absorb none of your opponent’s power, because their punch does not touch you. In fact the only thing it hits is thin air! • And best of all, after slipping your opponents punch; you are in the best position to counter punch them with speed and power. You may have heard it before, "The best defense is a good offense." While many can argue that this statement is absolutely true, it's so important that you become masterful at blocking, parrying, and slipping every kind of punch that your opponent may can throw at you. It is also just as important that you continually sharpen and develop your jab throughout your boxing career. Having a sharp "hard to counter" jab is essential to your boxing defense.